Proper hydration is of the utmost importance to our well-being and yet it’s something we need to be constantly encouraged to do. We all know by now that we should be drinking at least two litres of water a day but so few of us actually hydrate enough. Every function of our bodies is heavily dependent on the proper function of others but all depend on sufficient hydration and a healthy complexion is no exception. Your skin simply will not renew and rejuvenate itself at its optimum rate if you’re dehydrated. And remember that’s the state most people are in most of the time. So, we’re agreed we should be drinking more water but that often means more fluoride, more chlorine, more oestrogen and other hormones, and over 300 man-made chemicals. So let’s look at that list of horror tap water ingredients, why they’re bad and how we can do better without breaking the bank. Fluoride doesn’t improve the tap water’s quality or safety; It’s added solely as a medical treatment for the supposed prevention of tooth decay. This is medication, without informed consent, with no control over dosage and with no assessment of the individual’s suitability as a recipient. A healthy adult’s kidneys excrete around 50-60% of ingested fluoride each day and the rest is retained in the body, most in calcifying tissues such as the bones and pineal gland. The figures are much worse for children who retain up to 80% of ingested fluoride in their bones. The Centre for Disease Control and Prevention in the USA was one of the first to declare that any effects of Fluoride on the teeth are produced topically rather than systemically. This means that, if Fluoride has a beneficial effect on tooth decay (and that is now in serious doubt), it is by touching the teeth not by being swallowed and reaching them through digestion and distribution. There is absolutely no need for us to be swallowing Fluoride. The Fluoride in toothpaste or mouthwash, coming into contact with the teeth and then being spat out, is quite sufficient. Fluoride may damage the brain. It has been listed by the EPA as among about 100 chemicals for which there is “substantial evidence of developmental neurotoxicity”. In its March 2014 issue the world’s oldest and most prestigious medical journal, The Lancet, released a report officially classifying fluoride as a neurotoxin (in the same category as arsenic, lead and mercury). Fluoride may lower IQ. There have now been 33 studies from China, Iran, India and Mexico that have reported an association between fluoride exposure and reduced IQ. Fluoride affects the pineal gland. Flouride accumulates in the pineal gland in very high levels. Fluoride affects thyroid function. Fluoride reduces thyroid function to such an extent that it has been used as a drug in the treatment of hyperthyroidism. Fluoride causes arthritic symptoms. Some of the early symptoms of skeletal fluorosis (a fluoride-induced bone and joint disease) mimic the symptoms of arthritis. Fluoride damages bone. Tests have found significant correlation between fluoridation of water supplies and cortical bone defects and frequency of bone fractures. Fluoride may cause Alzheimer’s and other forms of dementia. There is a strong link between aluminium levels in the brain and Alzheimer’s and other forms of dementia. Our bodies have a barrier in place that does not allow metals to enter the brain but this is impaired by fluoride. The list goes on and on but the above should be enough to put anyone off drinking fluoridated water. The water boards are rather cagey about which supplies have fluoride added and which don’t and I would warn strongly against trusting any information that comes from them regarding fluoridation. The claim is that around 6 million people are affected by fluoridation but that figure is very difficult to verify and there doesn’t appear to be a national map reflecting which regions are affected. The official water quality figures for Yorkshire Water areas can be found by entering your postcode here. It appears that Barnsley supplies do not currently have fluoride added. Whether we would be informed if this was to change is not made clear. You may have noticed an unpleasant taste or smell when drinking tap water. This is likely to be the chlorine that is routinely added to it. Chlorine is a corrosive, poisonous gas that is changed to its liquid form by compression. The resulting liquid is mixed into drinking water and swimming pools to kill bacteria and other microbes. Chlorine is also used in, amongst other things, anti-freeze, pesticides and bleach. Unsurprisingly our Drinking Water Inspectorate claims that residual levels are of chlorine in our tap water are perfectly safe. However, the problem may not be chlorine itself but the way that it reacts with natural organic matter to form Disinfection By-Products (DBPs), such as trihalomethanes and haloacetic acids. A 1997 study in Iowa found that postmenopausal women living in areas with high levels of DBPs had nearly twice the colon cancer rate of low DBP areas. Evidence has also been building since the early 1990s of a correlation between chlorinated water and bladder cancer. Research suggests that drinking tap water while pregnant may double the risk of serious heart or brain defects in the unborn child. A study of almost 400,000 babies found a clear link between chemicals formed by chlorination and the occurrence of a trio of birth defects. 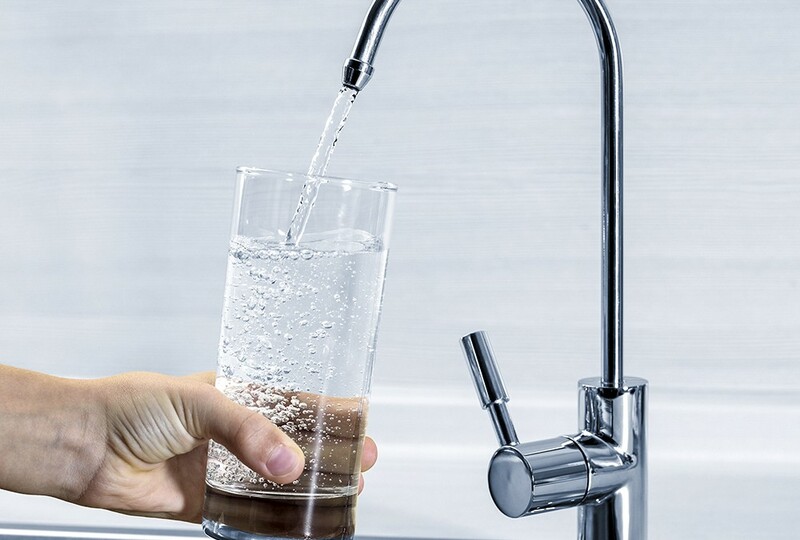 Several epidemiological studies, including research from the National Cancer Institute and 10 other organizations, linked the chlorination of drinking water to increasing an individual’s risk of developing bladder cancer, with some of the studies also claiming a higher incidence of Hodgkin’s disease, colorectal, esophageal and breast cancer. According to these claims women with breast cancer have 50 – 60% higher levels of organochlorines (chlorination by-products) in their breast tissue compared to women without breast cancer. Chlorination has also been associated with declining sperm counts, male infertility, and circulatory disturbances based on some animal studies. The water boards are very fond of inviting you to view the latest glowing reports on the quality of their supplies but none will tell you what level of oestrogen and other hormones are present because they simply don’t test for them. Ethanol oestradiol, an artificial oestrogen used in contraceptive pills and hormone replacement therapy which is between 50 to 100 times more powerful than natural oestrogens , is finding its way into water supplies due to it not being fully removed during the treatment of sewage. And then there are all the other hormones that are fed to (or injected into livestock) that make their way in into our reservoirs via the natural water cycle. Again the processes for removing these from water before sending it to your taps are often inadequate or non-existent and so little is known about their effects on our bodies. And finally we have a list far too long too even attempt. The 300+ man-made chemicals in your cuppa. These are sprayed on fields as pesticides, washed from roads and built up areas or are brought down from the atmosphere with the rain. All end up in our reservoirs and many are completely missed by the treatments that are applied before the water is piped to our homes. So there we have some very compelling reasons for not drinking tap water but what’s the best alternative? Well, predictably, I’m going to say drink bottled spring water. Unlike “natural mineral water” (which also comes form an underground source) spring water must be taken directly from a spring where it rises to the surface. This water has been filtered, over a very long time, through porous rock and doesn’t come to you brimming with the nasty ingredients listed above. Obviously cost is a consideration and many people believe that it’s a prohibitive one but what if I told you you can get your daily 2ltr bottle of natural British spring water for 17p? We recommend Aldi Chase Spring, bottled at source at the Chase Spring in Staffordshire. It has a good clean taste and, while most spring or mineral waters contain a small amount of naturally occurring fluoride, this water contains none at all. I think we can all agree that 17p per day is a small price to pay to avoid the horrors of drinking tap water. Another thing they don’t test for and, consequently, don’t tell you about. Plastic fibres! See this Guardian report. I’ve had a couple of messages claiming that Chase Springs water from Asda is actually just filtered tap water. Asda and Tesco were indeed exposed as selling filtered tap water but that was back in 2012. “Spring Water” is a term that can only be used on the packaging of actual spring water. Chase Spring water from Asda and Aldi is bottled at source at the Chase Spring in Staffordshire. A lot of cheap bottled spring water seems to come from Chase Spring. Aldi “Aqueo”, Tesco Value and Costco “Kirkland Signature” are just the ones I’ve noticed. I suppose cheap doesn’t necessarily mean nasty! Are more expensive waters like Highland Spring, Buxton or even Volvic any “better” through mineral make-up or purity, or is it all in a label and a place name? I think the difference between spring water and tap water is so huge that the difference between spring waters doesn’t matter. A good multivitamin/mineral supplement will cover all of your mineral needs anyway.